Elle’s beautiful, aloof mother dumps her in a New York apartment alone, just shy of her 16th birthday. The reasoning: her mother has a new boyfriend, and he’s just not interested in having a teenager hanging around. So Elle gets her own apartment, conveniently out of the way. After she moves in, she meets Frank, her next-door neighbor. Right away, she notices something different about him. She finds herself drawn to him. He’s a great listener, and Elle really hasn’t had anyone to really listen to her in her life before. When her new group of friends point out that they think Frank is transgender, Elle becomes very upset. During her sheltered life, she has never been exposed to any of the GLBT crowd before. She’s not sure what to do, and for a while she avoids Frank and her friends at school. She has a lot to think about. That’s the point of this book: what Elle is thinking about. It’s not a plot-driven story; it’s more about how Elle’s thoughts develop and change. I like that, actually. It gives the story a quiet, introspective feel. The language is simple, almost sparse, and feels thoughtful in the sense that these are Elle’s thoughts, her first-person narrative. She honestly discusses her preconceptions, hurts and fears throughout the book. I am always grateful to see books about transpeople. One of the most powerful motivators of hatred is fear and ignorance, and it’s a step in the right direction to be exposed to many different types of people in this nonjudgmental way. That said, I would really like to see more of these books about GLBT characters to be written by GLBT authors. I’m not saying that this would have been a better book had the author been transgender herself, but I would like to see more of our voices out there. All in all, a quiet, pleasant read. Happy reading! 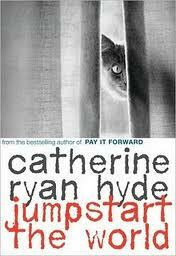 Hyde, Catherine Ryan. Jumpstart the World.New York: Alfred A. Knopf, 2010. 208 pp. Grades 8-10. Posted on April 23, 2011 by ShannaPosted in GLBT, Realistic Fiction, YA LitTagged absent parent, cats, FTM, GLBT, New York, photography, prejudice, teen issues, transgender.